​We believe that nutrition is the single most important factor contributing to the quality of your cherished companion’s life. 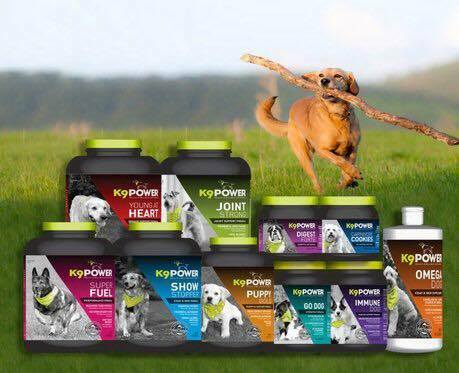 At K9 Power®, we are passionate about creating nutritional supplements for dogs that will build health, happiness, mental attitude and longevity. Impeccable quality has been the hallmark of the K9 Power brand for more than two decades. We look forward to building a long-term partnership with you in supporting the well-being of your pet. Our nutritional supplements for dogs are formulated according to health and wellness principles based on science and the needs of every type of canine and their stages of the life cycle. We strive to provide your pet with the highest quality ingredients and extracts and for two decades we have earned the trust of the most discerning dog enthusiasts. We believe getting ingredients in natural ways is better for your dog’s overall health and well-being, and, because of this, you will never find flax, soy, by-products, fillers, artificial colors or artificial flavors in our nutritional supplements for dogs. We know your pet is a part of your family and if it’s not good enough for you, it’s not good enough for your pet! K9 Power is a family-owned business, and our manufacturing facility in Benicia, California, is USDA, FDA, cGMP and FSMA Compliant. We are proud to use only the purest ingredients from premier human-grade suppliers that meet all GMP (good manufacturing practices). K9 Power adheres to the strict ingredient requirements of the National Animal Supplement Council. Meeting the highest quality standards has always been, and will always remain, the hallmark of K9 Power®.